Many said this place is shrouded with mystery and often remembered for the sad demise of 3 trekkers who lost their way inside this jungle to be found dead an year later. Many said about the two army choppers that had crashed here due to unexplained reasons. Many said about the deadly shrub Anamayakki (Dendrocnide sinuate) which causes severe fever, itching and rashes on body, which might even lead to temporary memory loss when touched on human skin. Many said about the high frequency of wild animal encounters in this region due to which it was avoided even by localites who go into the jungle for forest products. 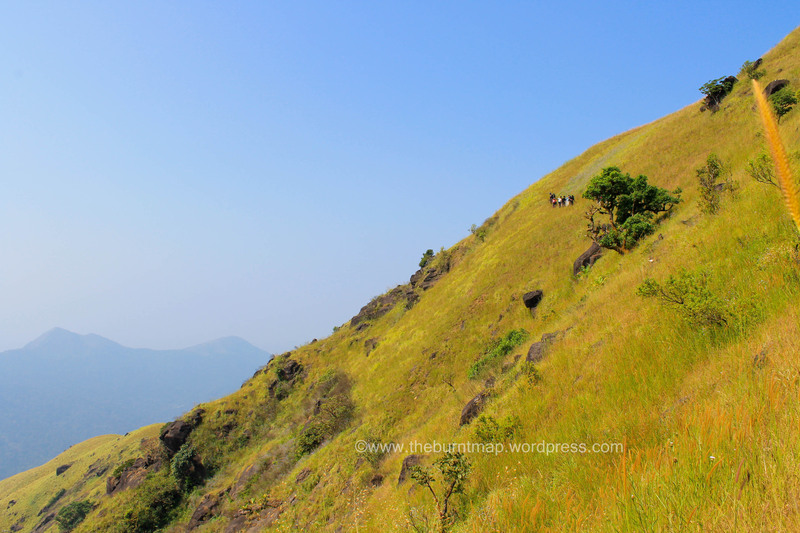 Many said this is one of the most treacherous treks in terms of steep climb, scorching sun and a risky walk around the slopes of a hill which has tall grass on one side a blind drop into the gorges on the other. If all these were not enough then add this, Many said there was not even a single drop of water available throughout the 12-15kms stretch until you reach the peak. AND TO MAKE IT A BIG ADVENTURE, ALL ABOVE SAID POINTS WERE TRUE TO ITS EVERY WORD!!! 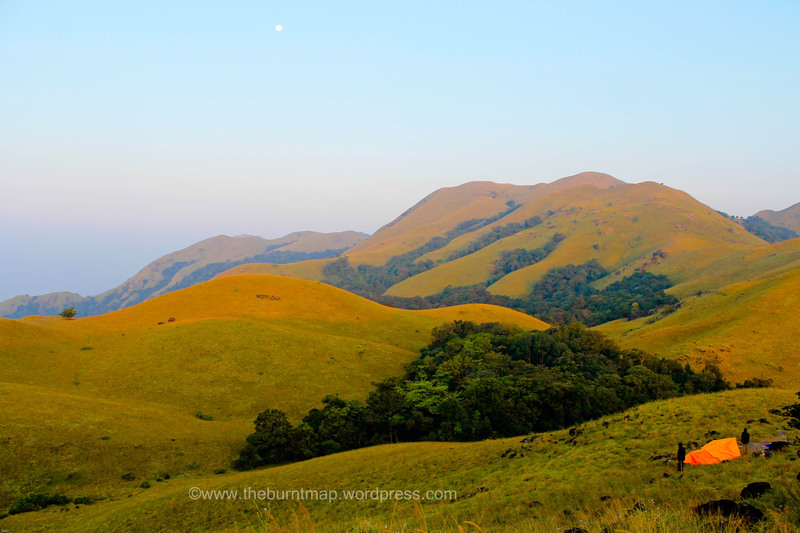 I am talking about Aramane Gudda – the palace hill, one of the highest peaks on the western ghats section of Karnataka. 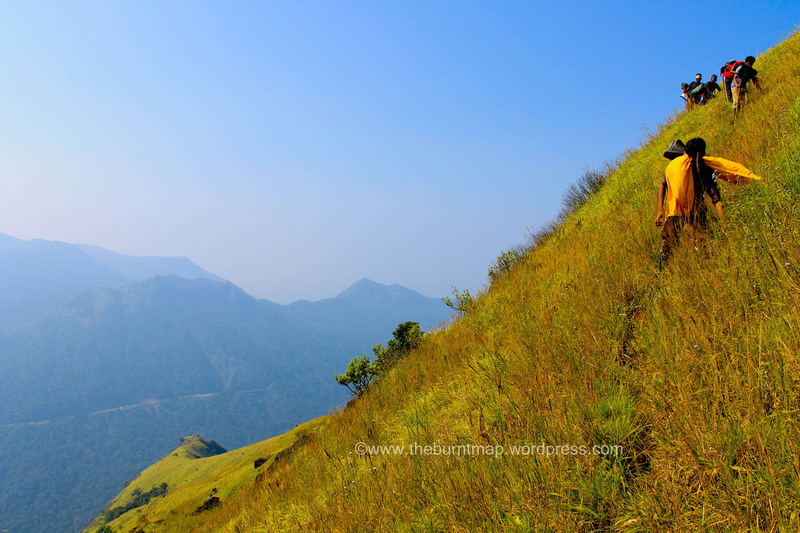 Standing tall at close to 1350 meters, this hill challenges any adventure lover. 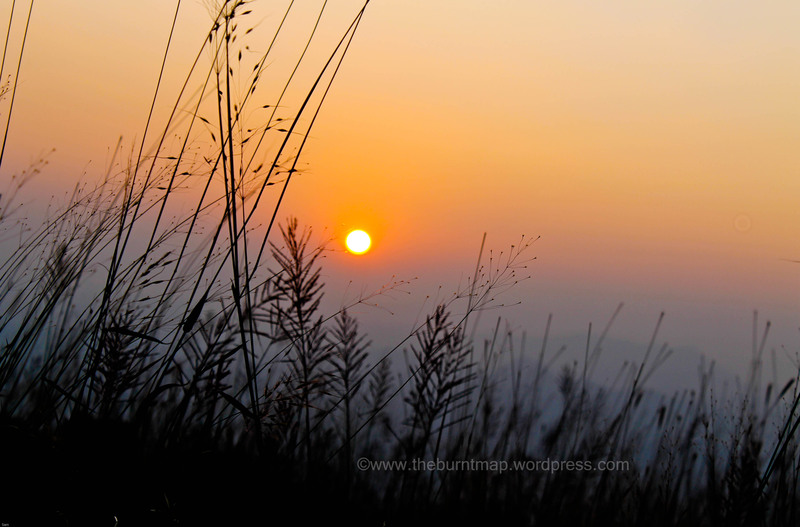 The hill is said to be called so since the time a king of Mysore planned to have a rice field set up there! The trail to this much talked about hill begins very close to my home in Gundya. Having seen this hill almost every day of my life, I finally decided to take on it. But had to have a sizeable company and an expert guide if this had to be made. On the evening of a Wednesday, I got a call from my home saying that some guys had called up enquiring about Aramane Gudda and were planning to be there by Saturday. Probably the time had arrived for me to witness the glory of Aramane Gudda. I decided to join those guys though I did not even know their names. But having just recovered from a week long illness of Dengue & Typhoid, I was not quite sure if had the fitness to trek such a height. Along with that, some commitments and other things kept me giving a second thought even till the last minute (to be precise, even till my first step into the trail). Though I was very confused, reluctant and not sure whether to give it a try or not, the night of Friday, I finally started my journey to my native, Gundya. After getting freshened up at home and relishing mom-made neer dosas, I joined the group of guys who were having breakfast at a nearby dhaba. One of the 12 guys was a trekker from Chennai, whom I had met on a trek to Arebetta during last monsoon. After being introduced to each other we met with our guide Devappa anna, a man in his late 60s and an expert of local forests. After enough warnings from my scared mom, carrying 2 phones with 2 sims of different networks, we prepared our backpack. Though my mom was reluctant to send me, I somehow convinced her. Later I found the blanket she had kept in my backpack which I had divinely forgotten. Given the temperature over the peak, a blanket was must. I love my mommy! 🙂 Finishing the preparations, carrying only very essentially required luggage, we got dropped in a jeep to the beginning of trail at about 5kms from Gundya. The trail begins at the National highway 75 (formerly NH48, between M’lore – B’lore) and leads directly into the shola forests. We were the first ones to tread on the path after monsoon (though there were hardly few trekkers gone this way!) and this was very evident looking at the imaginary trail. 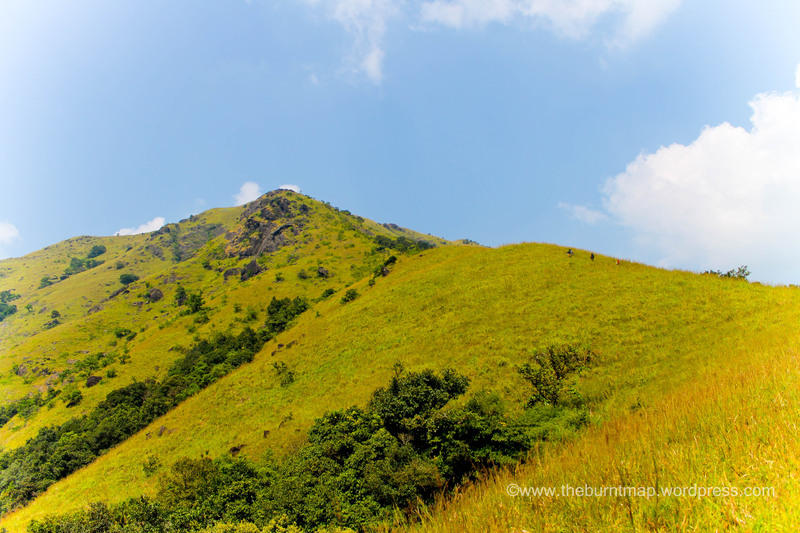 Being lead by Devappanna, we had begun the climb right away and gradually the noise of vehicles and a stream at the beginning of the trail started to fade away. Little did we remember that this was the last water source available for the next 14 kms and we had couple of empty bottles! Devappanna can be easily touted as the iron man of Gundya! Having lived more than 20 years of his life within the forest, this man in his 60s seems to know every shrub in the jungle. Till date, he has never worn a chappal and continues to tread through any path on bare foot. He was so quick that sometimes had to be slowed down for us to follow. He lead us moving away the small branches and thorny plants that were blocking the way. 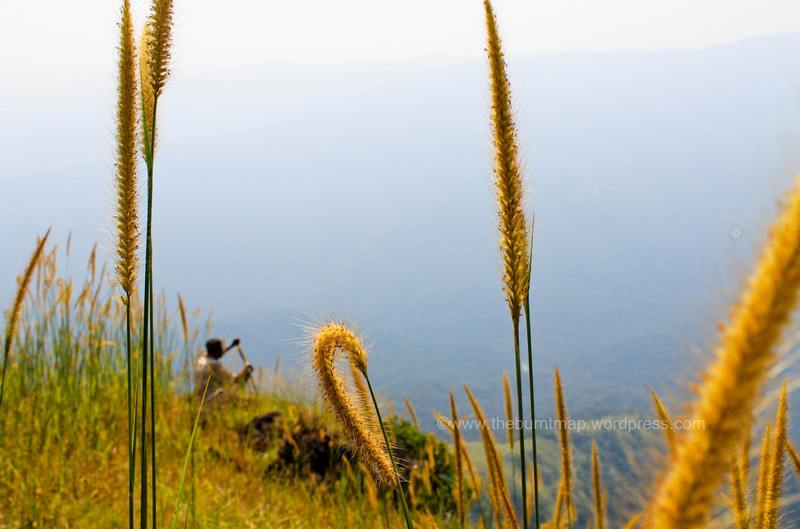 After a steep climb we reached a small grass land full of Dharbe hullu (Andropogon serratus), a forest plant with a feathery needle like flower, which grew upto 7-8ft height. We had to make way through these plants and lead into the next forest patch. Since the rains had stopped a week ago, there were hardly any leeches. After about 3-4kms of Climb and 2 more small patches of grassland, we reached our first stop near a single big rock. After resting for about 15 minutes, finishing half of the water (without knowing the agony awaiting), we trekked ahead. From this point onwards, you hardly get any forest cover. The path leads into an open grassland with tall Dharbe and Theruva (Citronella) plants. The theruva thailam (Citronella Oil) from Theruva plants is one of the main ingredients in all our inhaling oilments like Amrutanjan. The edges of Theruva leaves are sharp and gives a cut or rash when glided over the skin. Though not serious at all, the cut leaves burning skin. 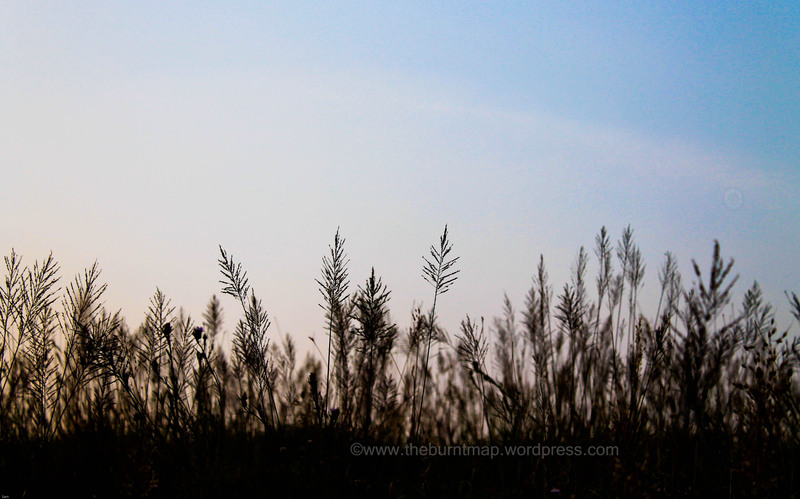 We were trekking the slopes through these grassland under scrotching sun tearing down every bit of our energy. Our energy was draining down and so was the water reserve. Few guys had some apples and even those were not sufficient for the beating taken by our body. Sun was showering mercilessly and before long most of the team was near exhaustion and we were hardly half way the distance. We were walking through the grassland with dense forests on either sides of the valley. The sun seemed to be burning only for us. Dried up water bottles, sweating faces, exhausted bodies could hardly make any move. It was then we saw the gooseberry (Phyllanthus emblica) trees with few berrys on it. Everybody fed on some berrys for that sour liquid content in it! But that little water could hardly even reach the end of our tongues. Finally we decided to take a small detour to fetch some water as our guide said there might be a stream few meters down the valley. But he was not sure if it had water or not. So myself and the guide decided to go take a look and call others only if we found water. We climbed down through the forest, taking some real deep steps and getting scratched by some tree branches. Moving through that forest seemed very difficult. At a point, the guide said, it would be better to climb to the peak where there is a water source than to climb down through this thick forest. We returned back empty handed to all those who were waiting for water. After a break, we resumed our trek again. We climbed high above the forest in the valley and the view opened up. Now the entire area around the hill was clearly visible from this point. Thick, dense forests on the slopes of the surrounding hills were visible from here. Edakumeri railway station and the railway track was prominently visible on the opposite hill, almost at the same height as we stood. Venkatagiri, another peak was right opposite to us. The Gundya Hydel Powerplant and Kempu holay river looked like a small white patch on a green canvas. Somewhere deep below, the national highway 75 was faintly visible. We were almost half way up. After admiring the view around, we turned to the side where we had to climb and raised our head up, Maaaannnnn!! Still so far to go?? The peak was visible way far up and the way that lead to it was an uphill climb in open grass land. A steep uphill climb. Then came the icing on the cake, Devappanna, our guide revealed that what we saw was just the peak! And we had to climb up this one and then walk around the slopes of another and later climb down the valley to the Summit!! Whatta wonderful trek, I say! After another short rest, we were climbing higher on a terrain that had tall grasses and big sized rocks on the ground. Every step had to be kept on the ground negotiating the huge stones. But things were getting very tiring on every step. Loads of elephant dung and pugmarks of bisons & other animals were seen at that place. If any animal showed up, given our situation, we weren’t in a state even to throw a stone let alone running away. Hunger started to creep up now. If I was few hundred meters downhill then I could have been eating mom made fish curry lunch! Psch!! :O Comfort is boring! 😛 I was following our guide talking to him as he understood only tulu and we slowed down for others to catch up. Suddenly we heard a animal grunt like sound from the valley or was it a growl? I just looked at the guide. Even he seemed to be looking at the direction where the sound came from. I calmed down myself and without showing up the slight fear, carelessly shrugged my shoulders and said, ‘Should be a wild pig, right?’. And then the growl was heard again from the slopes opposite to us, but nothing visible. Devappanna, the guide, having spent many years in & around the forest, was quite familiar to all kind of animal sightings and he just whispered, ‘may be a tiger or bear!’. I stood with a wide open mouth. We quietly waited for the others to reach us. Five minutes passed by like an year. The growl wasn’t heard after that. We continued our climb with Devappanna looking towards the sky and making a ‘thank you’ gesture! One of the guys was a first time trekker and he was finding it difficult to negotiate the slopes. A look back at the trail would have anyone feel dizzy and holding onto the trees. It was quite a steep. This guy from the group held onto such a tree branch and it got pulled out. Two rounds on his head and he landed in a bush 5 feets down. Somehow he got up, though no injuries, just few scratches, being without water made him really tired now. We waited for few more minutes for him to relax and started our trek again. Some faint trumpets, cackles and screeches were being heard from the forest in the valley deep down. Finally we reached close to the peak that we had seen way below from our trail. Now our guide led us around this peak. It was the slopes of the same hill and we were literally walking around the peak, on the slopes, to go beyond it. Our guide said the water source was another 4kms. We had to walk on a slope trekking up. It was like how an ant could climb up an upside down ice cream cone. Climb up, hold on to the ground and make sure you don’t slip. Because one wrong step and that would definitely be the last trekking step of life. 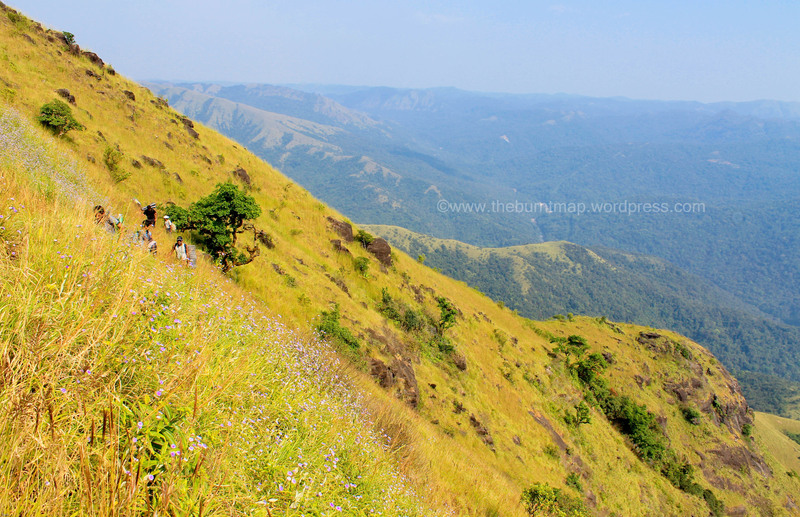 Steep slopes on the right side leading to the peak, slopes covered with tall dharbe and theruva with some flowering plants and a very narrow path that takes you around the peak. One the left side was a deep gorge of about 1000 meters depth. We had to walk for another three-fourth of a kilometer around this peak on the slopes. 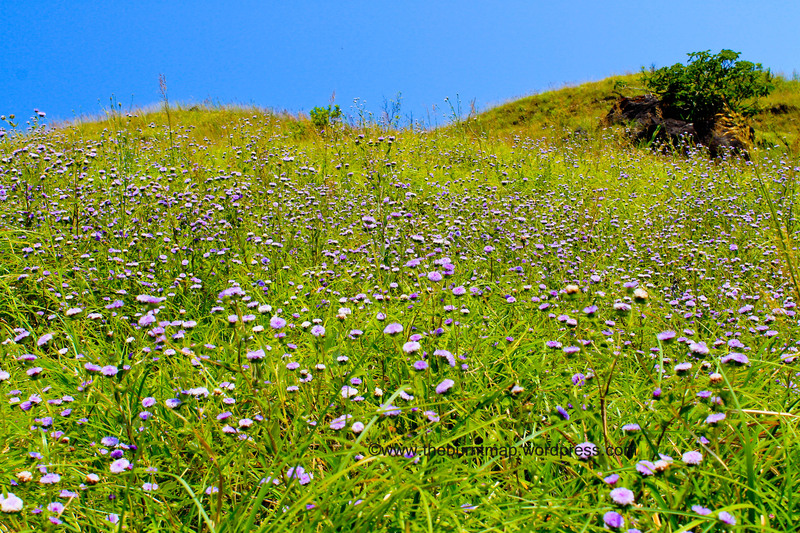 At a place, the slopes of the hill was covered with tiny blue flowers for an entire stretch looking like a blue layer of mattress. We treaded carefully around the slopes and came to the end of it. The view from that point was mind boggling. Thousands of feet below us a green patch of forests, a gustling river, black mark of the highway and the surge tank of Gundya powerplant. On the opposite hill to us was Arebetta and Edakumeri railway station, at a lower altitude. Most of the hills around were visible from this point. Walking on the ridges at its best! The guide lead us further into the valley where the peak and another adjacent mountain met and in between the ‘V’ we entered into a jaw dropping view. The fantabulous valley of Aramane Gudda! Wooow!! We had done it! The summit!! The Summit - Inside the patch of forest in the middle is our water source! A moderately deep bowl shaped valley with a small forest patch at the centre and largely plains. Covered by hills of varying sizes, the space in between was as big as a soccer ground. We were walking into the space that was like a fortress covered by hills and our guide pointed at the small forest patch in the centre of the valley and said, ‘adharalli neeruntu’ (there is water in it!). The last kilometer of walk into that forest patch through tall grassland seemed farther than all the climbs. The delight of seeing a small stream inside a cool, calm and silent group of trees after such a climb is nothing less than a paradise. The crystal clear water was chilling and sweet! This feel is more than mere words can hold! The tastiest water I ever drank! After gulping in bottles of water and cleaning ourselves we started to get hungry. Mom had packed me some dosas and I started munching on it with the guide. The guys started cooking Maggi and all of us had a ‘grand lunch’ in the given circumstances. 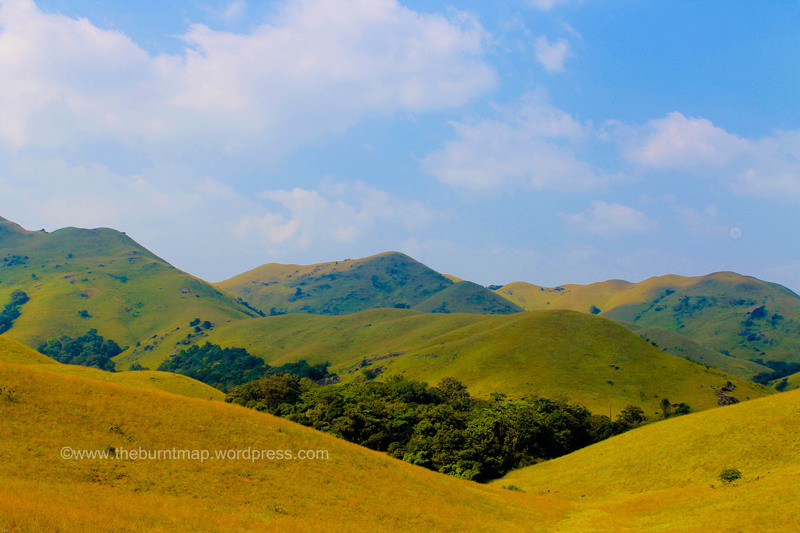 After relaxing to heart’s content, we headed out of the forest patch into the plain, Hills and hills around. Many single trees here and there, the one right at the peak of a hill catches anybody’s attention. It was like a group of ‘WWWW’s written all around with varying ascent & descent and we looking at it like from a bowl in between! Now we had to find a place to camp, sun was going down and wind was picking speed. We had to set up our camp site at a safe place. Myself and 2 guys from the group, climbed up 2-3 small peaks around the water source to locate one such spot. We had to find a place on the peak and nowhere near the water source or in the valley. Wild animals would walk through the valley to drink water and they would not want to be disturbed by the snoring us! Also the wind would be really speedy during the night and we did not want to wake up seeing our tent flying far away! Finally we found one such place on a small peak towards east of the valley. This part of the place on the peak was naturally set up like a table top with some flat rocks and then a wide flat step before beginning the slope. We preferred that wide stepped place which could block wind from atleast one direction. We just had to move few stones, clean the bushes and the place was ready. The remaining guys got some wooden logs and our camp site was in place. These guys had 2 plastic tents and they formed a long camp that could fit all 14 of us. The sunset was on and I ran onto the opposite hill to get a click. I had to climb down about 30-35 feet on the slopes and then again climb up the same height on opposite end to get the view of the valley beyond. By the time I reached the opposite peak, the red sun was going down in mist. Not the greatest of the sun sets I have seen but it definitely would have been better if not for the mist. Adieu, In hope of a new dawn! It started getting cooler and darker now. Our camp was set. 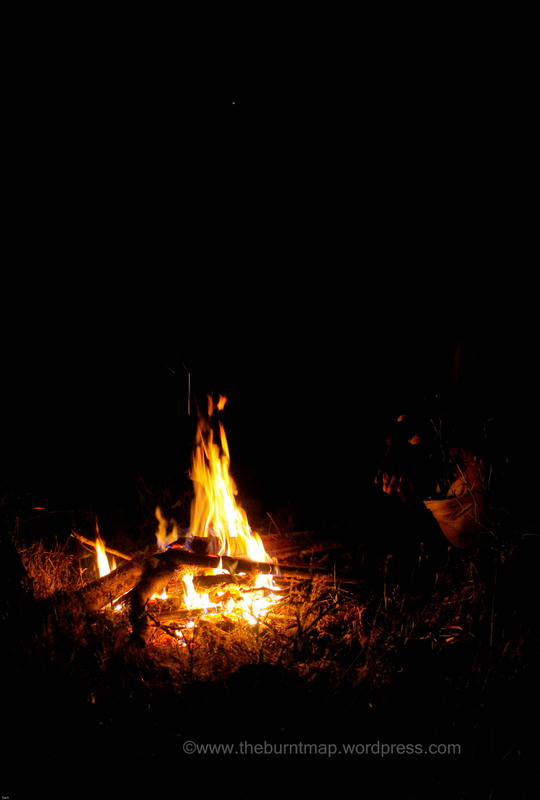 Devappanna gathered some dry wood and lit a fire nearby the camp. This was my first overnight stay at a peak amidst a forest. This was my first tent forming class. These guys had done it many a times and I had a decent lesson. They also gave the tip of laying the tent as low as possible so that the body heat remains within the tent keeping it warm. We filled in all our bags as pillows into the tent and cleaned up the place. The camp fire was keeping us warm and I also had my trusted sweater covering up. As night grew up the wind gained more and more speed. Gradually the entire place was pitch dark except for our campfire. Visibility was as good as being blind. Few steps away from the fire and next step had to be kept with sheer guts. Even if some bear or bison was staring at us, we could hardly notice it. The guys from Chennai, started cooking for dinner. Maggi was here to save us again. They even had some Coke & Fanta. Everybody were excited to be amidst a thick jungle on the top of a high peak, munching on maggi for dinner. It felt like a more lot closer to the nature. Devappanna kept the fire burning. Our campsite in a mist covered backdrop! We finished our dinner and then sat around the fire talking about all possible things from Mustard to Mars. 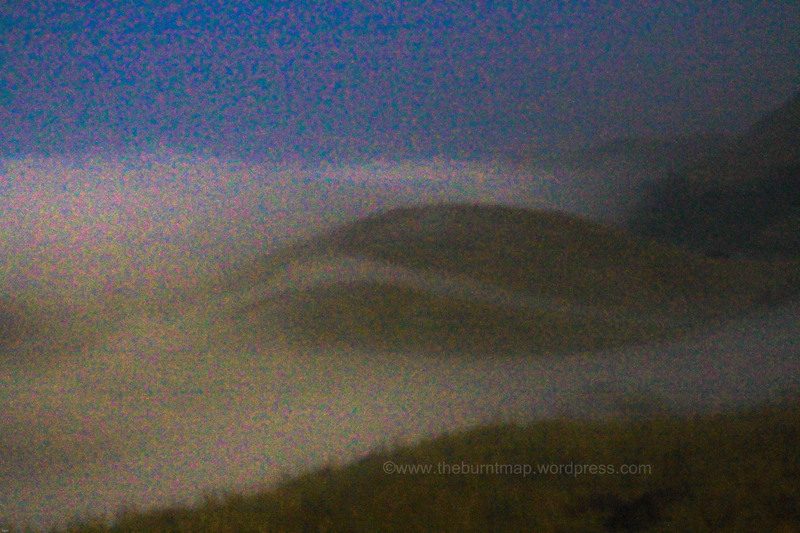 Just then somebody spotted an aura beyond the hill on which we had camped. We climbed up the hill with our torch lights and there it was.. Moon rise in the deep valley.. It was full moon today.. !! Glory! Glory! The golden crimped moon was lighting up the entire valley. By now the full moon had climbed up higher and was shining right above our campsite. Camp site under moon light, ah that was sweet like it rhymed!! 😛 Few stars also joined him in the party, twinkling and glittering. What was pitch dark few hrs back was now considerably lit. We could faintly see the hills around and the valley below where our water source lay. Moonlight, cold wind and the calmest of surroundings, this was incredible. BSNL mobile network was available even at this peak, surprisingly. I gave a call home to pacify my worried mom. 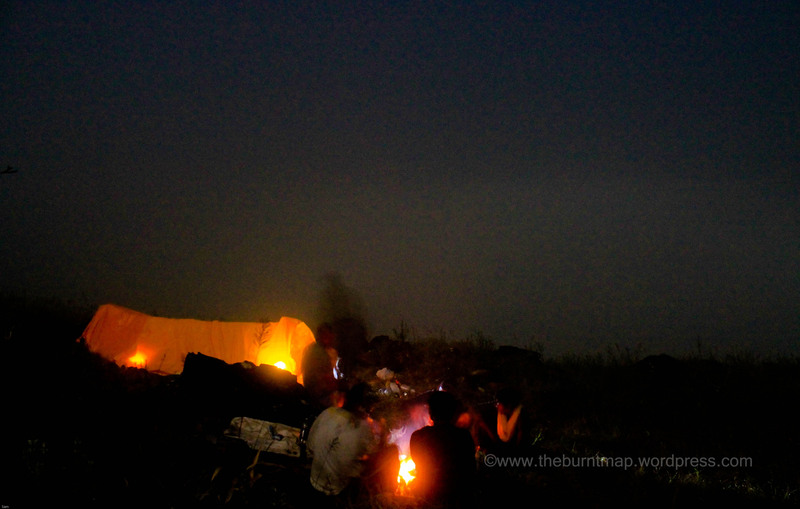 Took few long exposure clicks of camp site in the moon light. This was one of the grandest evenings I had ever had in my life. This was one of those days that doesn’t happen always. We were all warming ourselves around the fire and then something strangely beautiful happened. Since our camp was on one of the peaks, we could oversee the hills around. The curved ‘V’s and ‘W’s all around at different heights. In between one such ‘V’, between the slopes of two small hills, a white stream started to flow into the valley. Before we could realize, the white clouds flowing in through the gap had come into the valley below our camp site. White puffy cloud filled the entire valley around, beginning from the gap between two hills on the west. It flowed like a white river all around in the valley. The small patch of forest, our water source, the soccer ground sized bowl like valley below, everything was white and white only in color. Only the peaks could be seen raising above. In simple words, it looked a like a white sea of clouds and green peak raising from it. Sadly I could not take a good picture in that dark conditions. I tried my best with various settings to get one click but it also needed a tripod which I had not carried along with. Slowly the white clouds cleared the valley and again it was clear like before but before too long another fresh surge came in through the same gap of slopes and it repeated. We kept cherishing this happen atleast 4 times that night. Wish I could’ve taken a better picture! A sight that would be remembered for a lifetime! Bodies were tired after a tiring trek up the hill. But the happenings around kept us awake even after a six hour long climb under hot sun. It was an eventful night so far. One by one people started getting inside the tent. Devappanna preferred to sleep near the fire as he thought it would be congested inside and he was convenient sleeping in the warmth of the fire. All of us stuffed inside the tent and I was at the entrance to close the sheets. We kept the torches lit inside, since the tents were of orange color, the torch lights made it look like a large fire. This made sure that no wild animals came near to the camp. Also the guide kept the fire burning outside and had a watch over us. Within no time, all of us fell into deep sleep. Finally after such a long, adventurous day, body had taken over mind! I woke up when some water droplets fell on my face. The temperature had gone way down. Cold was seeping into every nerve! The mist fall had become so heavy that it got settled above the tent and was seeping inside through it. The tent had become all wet and drenched. Every time the wind picked speed, the tent would shiver and some drops would fall inside the camp. We covered up our heads with the blankets and went back to sleep again. I woke up again to cool breeze hitting me. Some creeping noise could be heard outside the tent. Probably the wind was hitting the tent so hard and making that noise. It was terribly cold. I could see the sheet covering our tent entrance was fluttering in the speedy winds. Wind was blowing at very high speed and our tent was trying hard to withstand it, But the entrance of our tent was just the ends of the sheet left free and they were fluttering, making a flapping noise. I tried holding both the ends of the sheet together, closing the tent entry. But the wind was way beyond my left hand’s strength. I tucked it under my body and slept over the ends, so it remain closed. But it kept pulling out. Finally I got out, brought a big stone and kept the ends of the sheet closed with it. This one worked and that was the last disturbance for our sleep! I woke up to our guide’s call. He was trying to wake us up for the sunrise. I sprang out in a flash, picked my camera and ran up. We had to climb up a small hill adjacent to our tent to see the sun rise in the valley. The valley was totally under mist and hardly anything visible. Far away in the eastern horizon, the sun had already risen up and climbing higher. We were again about to be deprived of another view !! With a heavy disappointment, I climbed down the hill towards the camp. But hold on! The sun rise show wasn’t over yet. 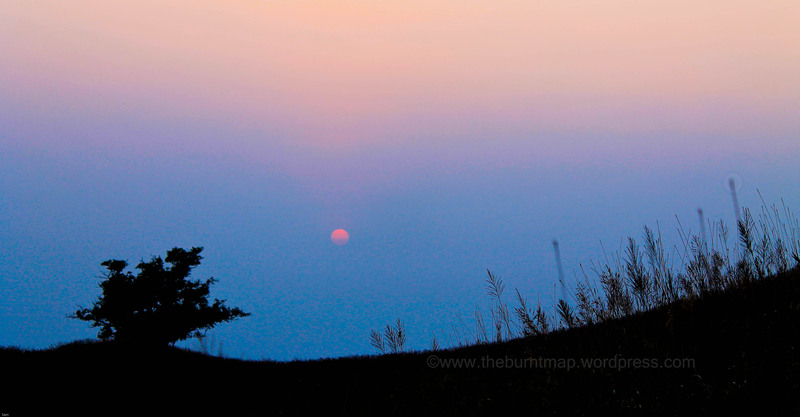 When I was half way climbing down the hill, I just turned back for another look at the rising sun. and there it was.. The reddish orange glory! Finally, a sigh of satisfaction! When I got back near the camp, I found our guide keenly looking at something on the ground a few feet away from the tent. I just went to him to see what was of such interest but only to be dazed! There were some bison pugmarks around that place, a few steps, it looked like somebody was curious of our camp last night. The thought of having been watched by a bison (one or more) gave a chill in our nerves. What if?? No.. !! That creepy sound that i heard last night?? Full stop! Covered in mist the previous night and soaking in sunshine now! We spent some time walking around the hill, taking in the cool air and fresh oxygen! It was quite a delight to be at that place. Cool breeze, mildly cold climate and the breathtaking view in front. The mist had cleared up by now and we could see the Kempu-holay river faaaaar below, like a white creak amidst the green forests. It was a priceless morning that I can hardly explain in words. Our guide was constantly reminding us about the difficulties posed by sunny day if we descended late. So finally we packed up our luggage and of course the entire trash (including Cigarette pack covering strips! Yes!) and climbed down to our water source. We cooked another session of maggi beside the stream and everybody had their stomachs filled before packing up one last time before the descent. The blue flowers along the ridges! 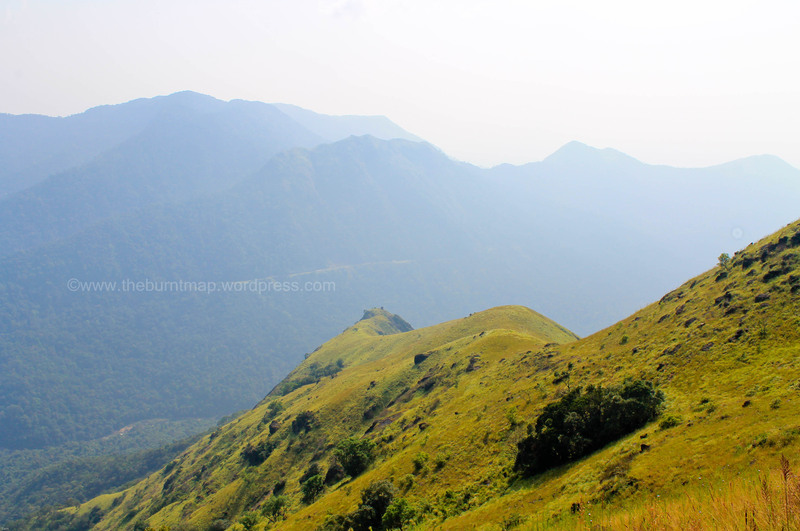 We were finally moving out of the Aramane Gudda that had ‘bowl’ed us by its charm, Walking out of the valley, we came straight into the ridges, through which we had done a very careful trek last day, But while climbing down, it seemed more difficult. If the stone that we step on was not firm enough on the ground then it used come out and roll directly into the gorge. It was scary! We had to step on stones with utmost care and only after making double sure that it is strong & firm on the ground, The slopes had the same tiny blue flowers all around and the view this morning seemed better that last day. 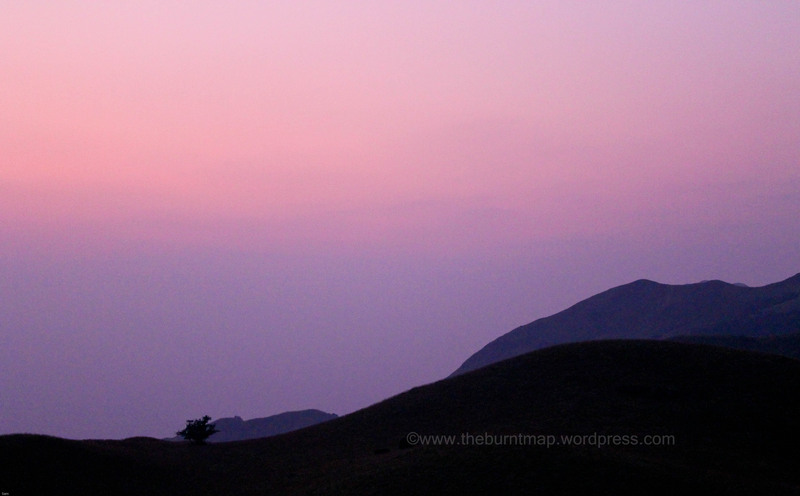 After close to an hour of very careful trek, we were out of the ridges and back in open grassland, descending. Our super fast guide awaits us ahead! Now we were close to the closing point. I rang up home and asked them to send the jeep. 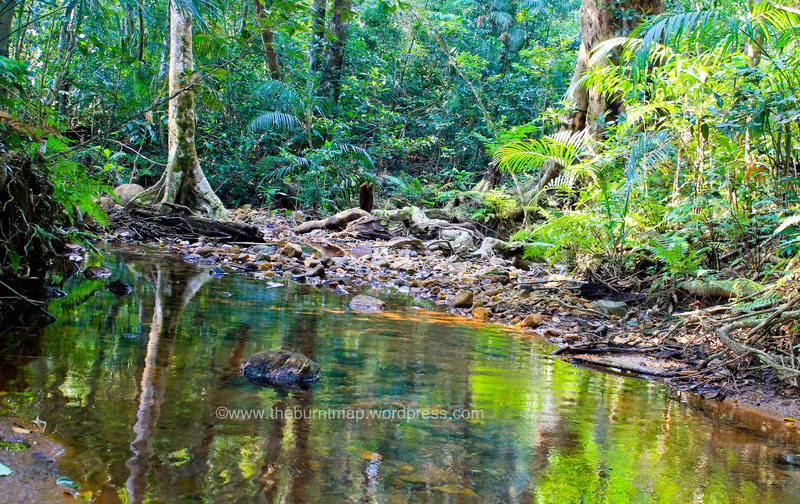 The last part of the trek was through thick jungle and many wild thorny plants blocking our way. Our guide moved it away and still the slope was quite a steep one! After few more minutes, we finally heard the stream, which was supposed to be the first water source that we missed last day. This meant we were approaching the main road and in few more minutes we could hear the vehicles. As always, the last kilometer seemed the longest of all. The joy you feel while stepping onto the highway to see a vehicle awaiting you and the thought that you don’t have to walk anymore is stupendous. But if you just turn back and take a look at the peak, the joy of having conquered that is more than any money can buy!! Trekking our way down - The blue flowers are faintly visible left of the trekkers! The best evr blog tat i hav evr read abt armane gudda. Me n ma frenz r planning to hit diz post october. cud u plz give me more info on dis? just i need ur contact no or plz giv me d contact no of guide devappanna. Hi Rajaram, thanks for dropping in! Still, you can contact the Forest Office at Sakaleshpur to know if the ban has been lifted. I am Prashanth from Bangalore. I’m planning to trek aramane gudda for this new year with few of my Friends. I red your beautiful blog which made me to decide I should do this trek. Please share guide phone number to know much about this and to seek his help for trek. Hello Prashanth, I am very sorry for replying this late! Met with an accident and was away from all connectivity for more than a month! I hope you had a good trip to start the year! To answer your question, Aramane Gudda is officially restricted now after few trekkers went missing, nevertheless you can request for trekking permission from forest ranger at Sakleshpura and give it a try. The guide that we went with resides in Gundya, my native. I can always connect you with him. I hope this was helpful, thanks.